Is there anything more to be said on the topic of GWR 4-6-0s in general and the Kings in particular? It’s a subject that has been covered so many times by people who knew the locomotives, like O. S. Nock, and in the case of Kenneth Leech, fired and drove them. Surprisingly, yes, and this book is not only beautifully put together, in a clean, crisp format, with excellent black and white and colour illustrations, but it brings the story of the kIngs right up to date, culminating in the fabulous restoration at Didcot of the new blue King, No 6023, King Edward II. It is particularly interesting in its treatment of the later days of the Kings, of their withdrawal in 1962 and covers, for example, the brief respite given to 6018 King Henry VI in 1963, the journey to Wales of 6023 and 6024, leading their eventual salvation and the issues surrounding KGV’s incarceration at Swindon. So, definitely recommended for all GWR enthusiasts. 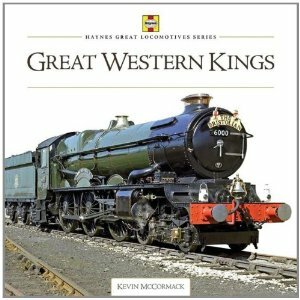 Is this now the final word on the most majestic locos the GWR ever had? Probably, but where has that been said before? Click here to buy it direct through us. Note also that you can also still buy copies of Ken Keech’s authoritative ‘Portraits of Kings’ at incredibly cheap prices.